At worst, the Renault Twizy, you might think, isn't a relevant new car choice at all - too draughty, too slow, too hemmed in by its 60-mile range. On the other hand, it's a cheap-to run, zero-emission bundle of fun that shows there's still life in the beleaguered and battle-scarred French car industry. Question is, how would you react if you dialled 999 and the responding arm of the law arrived in a police-liveried Renault Twizy? Of-the-times policing, or laughably unfit for purpose? 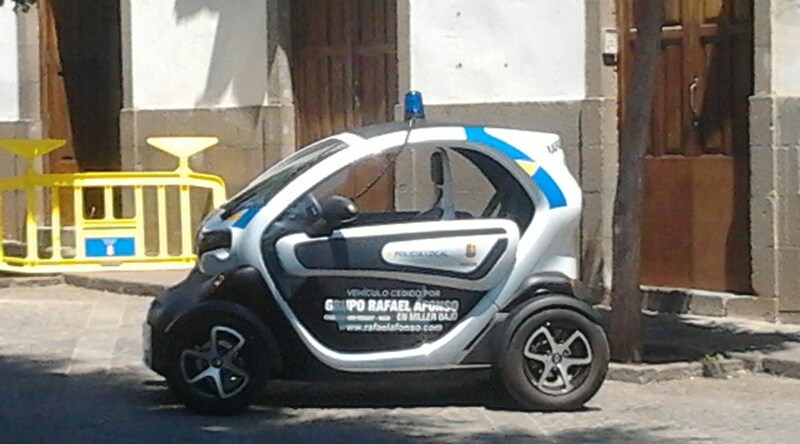 It seems improbable, but we've been sent these pictures of just that: a Renault Twizy police car, spotted on the beat on the island of Gran Canaria. A Renault Twizy police car - are you sure? Oh yes - see for yourself. CAR reader Ivan W. Scully sent over his shots of a Twizy complete with police force livery and delightful blue flashing light atop the roof, snapped while on holiday in the Canary Islands this summer. Clearly the Twizy isn't going to be the new mount of choice for Britain's motorway cops, but the idea of usage in pedestrianised city centres is a compelling one. Perhaps a panda-car Twizy is just the addition to the force needed in Britain for monitoring city centre streets on a weekend, keeping tabs on our alcohol-indulged youth.